Is Bone Broth the Magic Elixir It Seems to Be? An ode to a kitchen tool I did not know that I needed. Yes, sweet can be beat. A case for store-bought bouillon cubes. In which we take stock of stock, and help find the best store-bought option for your holiday season. Breaking down a chicken isn't as hard as it seems -- Cara is here to show us how. It's impossible for us to pick one favorite way to prepare corn -- but perhaps the best way to embody all its goodness is to turn it into risotto. We love kale's leaves, but its tough stems stump us. In honor of Earth Day, we're about to change that. 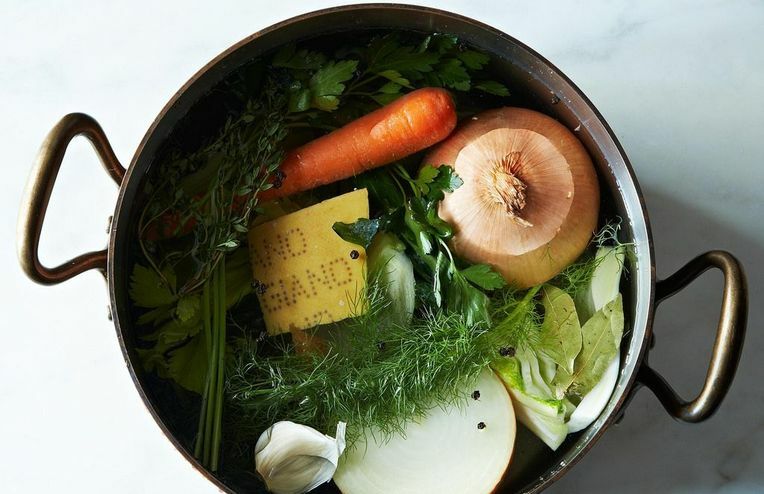 Today: Food52's Assistant Editor, Marian Bull, shows you how to make soups and stews more flavorful with whatever vegetable scraps you have on hand -- or the cheapest produce at the market. Maddy Martin beats back flu season with the purest, simplest, most throat-coating form of chicken noodle soup. Jennifer Steinhauer (our Weeknights with Jenny dinner savior) teaches us the secrets to the best DIY chicken stock. We finish up our collaboration with Mario Batali's How To Tuesdays, and learn how to make simple stock from scratch. Every week, a DIY expert spares us a trip to the grocery store and shows us how to make small batches of great foods at home. Today, Hiroko Shimbo, author of Hiroko's American Kitchen, shares two stocks that will make Japanese cooking a reality in all of our kitchens.